In the galaxy's most oppressive, urban environments, there are still some who dedicate themselves to fighting back from the shadows. These Sentinels are the last bastions of hope in these desperate cities, and theirs is often a thankless vigil. Even as they try to redress unsolved crimes and loosen the Empire's stranglehold upon their worlds, they risk being reported by ordinary citizens who think they're doing the right thing. 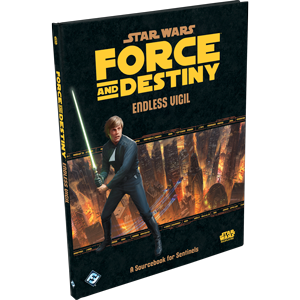 These Sentinels and their labors gain new support from Endless Vigil, a Sentinel sourcebook for the Star Wars®: Force and Destiny™ roleplaying game. Its 96 full-color pages introduce new specializations, species, signature abilities, and gear. Additionally, Game Masters will find a wealth of material designed to enrich their urban encounters; new droid adversaries and information on podracing run alongside tips and charts to help you get the most of your urban encounters and investigative adventures.